Five years after the events of Mamma Mia!, we find Sophie (Amanda Seyfried) preparing to reopen her mother’s hotel on the beautiful Greek island of Kalokairi. As the grand opening draws closer, we learn more about her mother's past. If ever there was a need for the unbridled joy, laughter, love and friendship displayed in Mama Mia 2, well that time is now. A shot of pure feel-good escapism, we need this movie just as much as it needs us. It is, of course, wonderful to catch up with the returning cast of Mama Mia. Meanwhile, the fun continues as we meet a host of new characters. While it may not have as compelling a narrative as the original, the sequel is a worthy, endearing and ultimately satisfying addition to the story. Cleverly (and seamlessly) moving between Donna’s past and her daughter Sophie’s present (and future), Mama Mia 2 explores the powerful bond between a mother and a daughter. It celebrates friendship and it embraces love. Directed by Ol Parker, Mama Mia 2 is also an absolute blast. It is obvious that this was a fun film to make - perhaps almost as much fun as it is to watch. Everyone involved (in both timelines) is utterly charming. Meanwhile, the stories are set against the stunning backdrop of Donna’s Greek island paradise (although the movie was actually shot in Croatia). Reality is certainly not on the agenda. 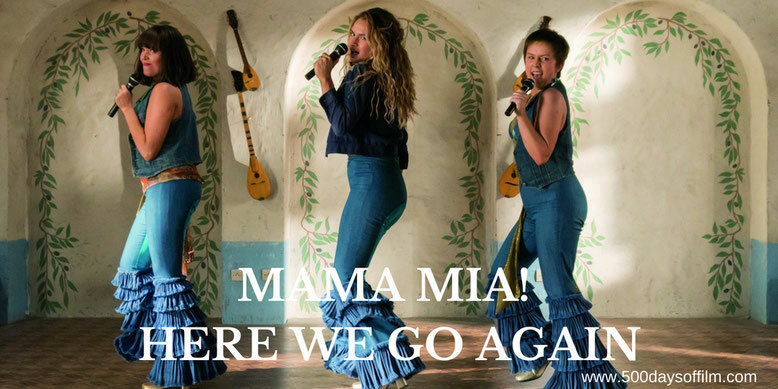 Carefully maneuvering around the original’s (potentially tricky) three dad narrative, Mama Mia 2 is gloriously light and fluffy. This is a film that embraces a fairytale - punctuating its story with a constant stream of timeless, toe-tapping ABBA classics. However, anchored by a poignant performance from Amanda Seyfried, there is also real (and surprising) emotional depth. It is not on the level of, say, Toy Story 3 but, if this story draws you in, you are going to need some serious tissues by the end. The returning characters from the original film are much beloved by audiences. As a result, the new faces need to make sense and also make us care about Donna’s early life. A rather delicate balancing act. However, who could resist Lily James? Her youthful exuberance is nothing short of infectious. Sensibly avoiding imitation, we sense Streep’s Donna in James’s portrayal - but nothing feels forced. Likewise her supporting cast. All manage to capture the spirit of the “older” characters. This storytelling technique could (and in other movies certainly has) have gone horribly wrong. Kudos then to the cast (and the casting team). As in the original, everyone gets a musical moment. And, as in the original, the women fair far better than the men. Lily James and Amanda Seyfried give beautiful vocal performances. The men are pitchy (putting it mildly - and kindly) in comparison. However, surely this is the point of the Mama Mia films. We are not here for polished, over produced ABBA numbers. We are not here for studio perfection and the films are both far more endearing and enjoyable for that. Mama Mia 2 just wants us to have fun. It wants us, if only for a short while, to feel better about life. Thankfully, this sequel succeeds. You can sign me up for the sing-a-long screening now. Make sure you stay to the very end of the credits for a funny extra scene. Have you seen Mama Mia 2?